Sourcing the very best sustainably managed timber for each and every one of our High Wycombe door projects, our joinery team are whole-heartedly committed to using traditional joinery methods. Our high-quality timber door products are all dealt with in-house, to retain the highest standards possible. At Kirkman Joinery, the spotlight is firmly fixed on our experienced and knowledgeable joinery team providing every High Wycombe customer with a smooth and flawless service that’s second to none. With many years of joinery experience to share, we’re confident that there’s not much we don’t know about timber door installations in the High Wycombe area. 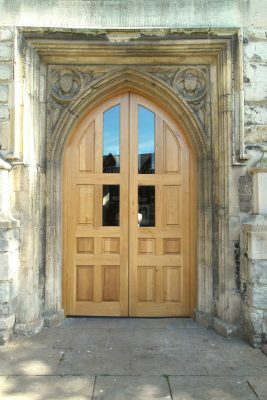 From Hazlemere to Bourne End and Cookham to Walters Ash, you can depend on Kirkman Joinery to provide you with a unique timber door installation that’ll become a genuine talking point whilst standing the test of time for many years to come. Need to discuss your door project further? Don’t hesitate to give the Kirkman Joinery team a call on 01494 461 116 or send us a message online and we’ll be in touch very shortly to move your front door revamp onto the next level.